We all know the feeling – a quick glance at the clock, only to realize that several hours have passed as you tweaked this and that in your design. You’d like to think that the extra attention to detail and late-night coffee breaks make all the difference when it comes to the success of a design. And don’t get me wrong, they most certainly do! But the truth is, more than anything, it’s how you present the design to your customer that can really make or break the sale. So, what are the essential elements when it comes to presentation and what is it that the customer really needs to know? An overview of the plan itself is most certainly in order, and will allow your customer a quick summary of the design in its entirety. At the same time, you don’t want the finer details and essential information to get lost. Dimensions, text clarifications, close ups and company and plan information – all of these can give your viewer a deeper insight into the plan you’ve created. But don’t head straight for your arts and crafts stash. 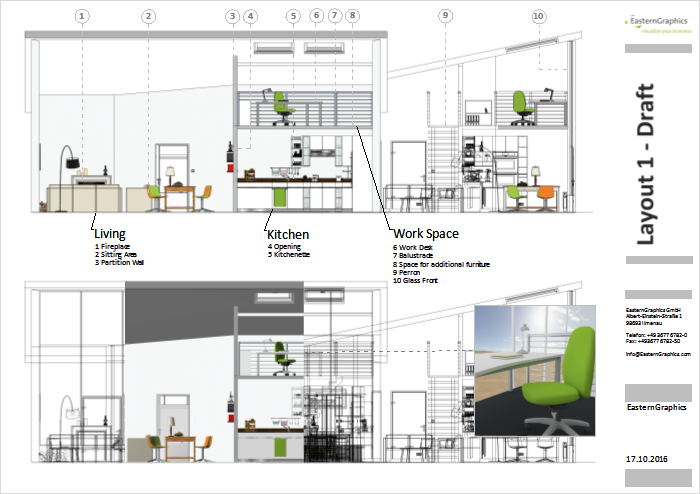 The days of hand-crafted mood and concept boards are out, and digital concept layouts are here to stay! Luckily, pCon.planner offers the perfect tool to do just that, and with the newest planner version, it’s even better than before! Exclusively for pCon.planner PRO, the layout area allows for the professional creation of digital layout pages. With the ability to insert multiple viewports, you can provide your clients with a fantastic overview of the design you’ve created, as well as a glimpse at various perspectives and finer details. This combined with the ability to print true-to-scale designs makes creating concept layouts practical and effective! But new features in pCon.planner 7.4 take things one step further. With the newest planner version, you can insert dimensions directly into the layout area. That means there’s no longer a need to insert dimensions directly into the design area of your plan. With this feature, you can adjust size ratios in respect to the scale of the page and clearly outline the essential information your customer needs. Dimensions are available for all 2D viewports as well as isometric perspectives. pCon.planner 7.4 makes it easier than ever to align and organize your different viewports within the layout area. A clean, decluttered concept layout is one of the most important aspects of a great plan presentation and new alignment features will help you reach this goal. New snap points, for example, make it easy to align various viewports. You can also freeze the viewport scale to save the integrity of the design when zooming. Sometimes it’s helpful for the design area of your plan to communicate with the layout area, while other times you’d prefer them to be completely independent of one another. With 7.4, you get the best of both worlds! When it comes to object selection, the two areas are now connected. That means, when you select an object in the planning area, it will also be selected when you switch to the layout page, making it much easier to find. Objects created for the layout area, on the other hand, will not be visible in the design area. Instead, objects for the layout page are own their own layer, keeping them separate from other design layers. Think your business could benefit from the layout tool? Download a trial version of the planner to test it out yourself or e-mail us for more information on obtaining a quote for pCon.planner PRO today! This entry was posted in Presenting, Room Planning and tagged layout, pCon.planner PRO, room planning. Bookmark the permalink.